Our Best and Highest Rated Media Player!!! Facebook: If you want the best in media players, right now this is it! Item 890: Total: $198.95Can or $153.04us Brand New Do you want a $100 machine or a $300 machine for $198 total? 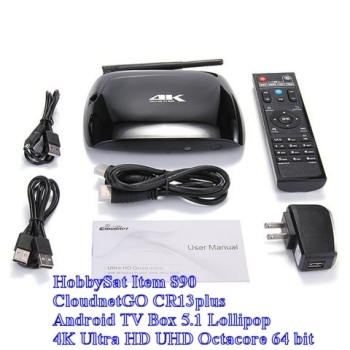 Android Boxes 5.1 Plug n Play. 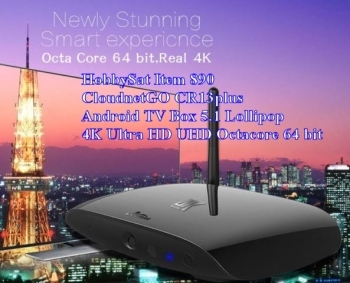 4K Ultra High Definition UHD TV Box. 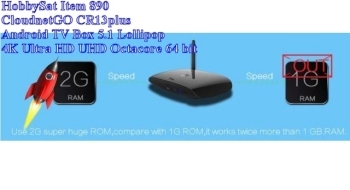 Are your other boxes Lollipop 5.1 or 64 bit octacore? Chipset: RK3368, fastest performing box in North America. Save $100 on manufacturer's Price. Highest performance Score on the AnTuTu Testing. 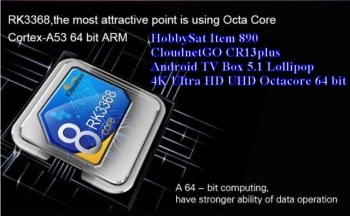 Octa Core ARM with Cortex-A53 64bit able to reach 1.5Ghz. GPU PowerVR G6110 capable of playing video at 4K 60fps and supports hardware decoding for H.265 codec. 16GB eMMC storage memory in its basic configuration. WiFi Dual Band with external antenna and Bluetooth 4.0. If you are using these boxes below, see what you are missing! 1. Strongest CPU: Octa-core 64 Bit Cortex-A53. 2. Latest GPU: PowerVR G6110, supporting OPENGL ES 3.1. 3. Super Video Output: Supports 4K × 2K H.264/H.265 60fps hardware decoding. 4. Super HDMI Output: Supports 4K × 2K HDMI2.0 @ 60Hz output. 5. Highest Level of Security: Supports Security OS, mainstream DRM and HDCP2.2 safety standards. 6. Latest Android Systems: Supports Android 5.1 Lollipop version. 7. Best Value for Money and Quality: Antutu Benchmark exceeding 38,000 scores. With respect to the 32-bit processors, such as Cortex-A9 and Cortex-A7 processor, Cortex-A53 processor configures for optimum performance, scalability and energy efficiency over 30%. 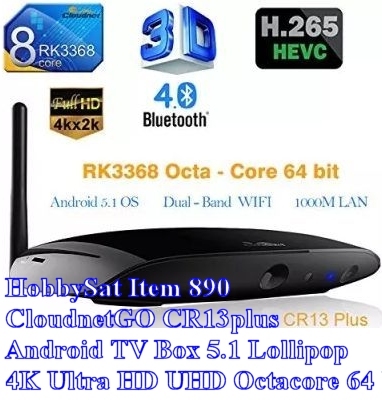 Being the first Cortex-A53 Octa-core 64-bit processor OTT BOX products, using RK3368 series, CloudnetGo series will accelerate the continuous updating of OTT TV boxes, becoming the star and catalyst of OTT BOXes. 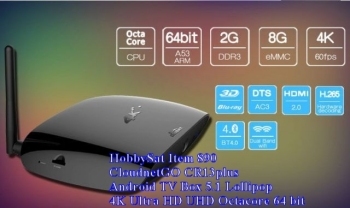 CloudnetGO Octa-core 64bit Tv Box: A new generation flagship model CR13 Plus! 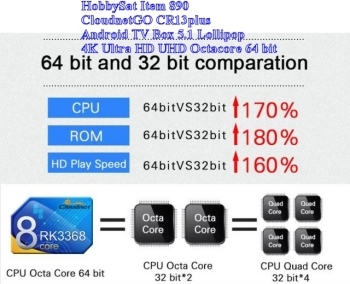 Being the world's first Octa-Core 64 bit TV boxes, CR13 Plus adapts the brand new Rockchip RK3368 chipset. Main fluency up to 1.5GHz. The most powerful 4K×2K video output. Supports Security OS and mainstream DRM and HDCP2.2 safety standards. Antutu running over 38,000 scores. The strong points of RK3368 are numerous. The ARM Cortex-A53 processor is the most power-efficient and smallest ARMv8 Cortex A-50 processor, capable of seamlessly supporting 64-bit code, higher performance, and lower power consumption. It can run at full speed at high loads and also close the core quite flexibly at low loads, reducing the frequency mode to low-performance and low-energy efficiency. - double the width of process data inflow, supports larger memory flash and provides higher large-scaled data processing efficiency. Cortex-A53 also has many important features, such as support for virtualization, 256 TB storage, supports ECC L1 and L2 cache and so on.